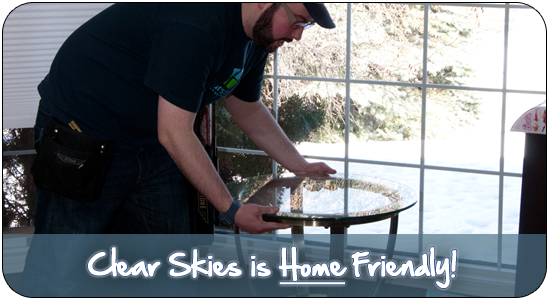 Clear Skies Is Home Friendly! deserves a lot of respect. Your home is your castle, your pride and joy, a symbol of your hard work and tenaciousness, and a gathering place for the most important people in your life: your family. That’s why Clear Skies Window & Gutter Cleaning obsesses over finding new ways to be even friendlier to your home. Do you have some delicate furnishings that need to be carefully removed from near the windows, before we get started? No problem! Do you have some gorgeous draperies or window coverings that require a delicate and skillful touch? We’re ready. Do you have some beautiful light colored carpet in some of your rooms, that would show up even the slightest hint of dirt? We’ll take extra precautions every time. Do you have carefully manicured gardens and plantings close to your home that need to be gingerly stepped around as we use our ladders on the outside of your home? Don’t even worry about it. We’ll tread lightly, and treat them as if we planted them ourselves. Do you want us to use our rubber ladder stoppers on your delicate stucco exterior walls, or easily damaged decorative window sills? No problem, we were going to use them anyway. Are you concerned about whether or not your gutters are strong enough to hold the weight of our sturdy ladders and a grown man climbing up one of them? We use ladder stand-offs, so it’s not an issue, don’t worry. With ladder stand-offs, all of the worker’s weight is safely supported by your strong roof, not your fragile gutters. We totally understand. Your home is your haven. We promise to treat it with the utmost respect and care. That’s why Clear Skies Window & Gutter Cleaning has a “home-friendly protocol” in place, ensuring that you always, always, always feel safe and in control, and that your family continues to come first. Do we sound like the kind of window cleaning company that someone like you would want to do business with? 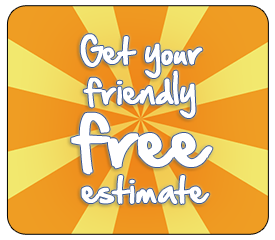 Please call or text 780-995-1181 right now for your free, no obligation estimate, and discover the difference that insisting on the home-friendly window cleaners at Clear Skies Window & Gutter Cleaning can make in your life!